As a parent you may find it challenging to provide your children with healthy, tasty and creative snacks during the school year. 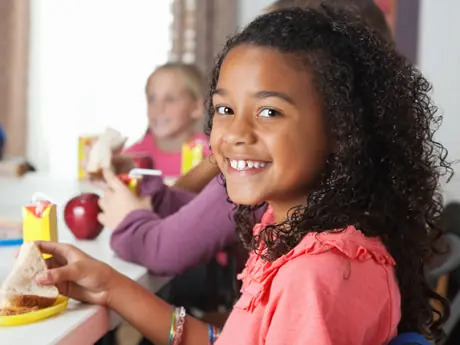 Time constraints, picky eaters, food budgets and limited ideas are a few barriers you may face during the school year when planning and preparing snacks. Encourage your children to help you prepare their own snacks and lunches. This will give them ownership of their food choices and help them develop healthy eating habits. Look for whole wheat crackers such as Triscuits, Ak-Mak, Rye Krisps or Breton. Choose crackers that contain no partially or fully hydrogenated oil and have at least three grams of fiber per serving. Try vegetables such as baby carrots, grape tomatoes, green or red sweet pepper slices. Add whole-grain crackers, pretzels or pita chips for additional crunch and flavor. This is a colorful and tasty snack packed with fiber and vitamins such as vitamins A and C.
Smart pretzel choices include Snyder's of Hanover whole grain varieties, Utz, Nature's Promise. Nature Valley, Kashi or Full Circle granola bars are great options. For cereal, try whole-grain options such as Cheerios, Rice or Wheat Chex, Kashi Heart-to-Heart Cereal, Barbara's Bakery Puffins or Shredded Spoonfuls, or Kix. Purchase small, reusable containers for the pretzels or cereal. This will encourage children to take home what they do not finish and teaches them to not waste food. Katie Jeffrey, MS, RD, CSSD, is a registered dietitian, Board Certified as a Specialist in Sports Dietetics, a columnist, and the owner of FitNutrition, LLC, in Stonington, CT. She provides individual nutrition counseling, sports nutrition counseling for athletes and educational nutrition presentations on various topics for all age groups. For more information, call 860-917-6131 or go online to www.fitnutrition.net. Join FitNutrition, LLC on Facebook at http://www.facebook.com/FitNutritionLLC.